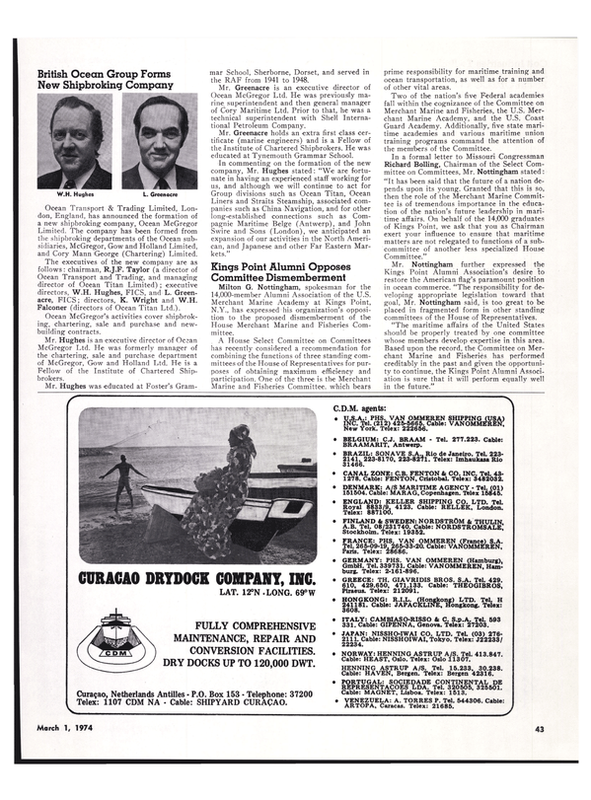 Amtorg Trading Corporation, which represents Soviet foreign trade organizations in the United States, will open a new office at the World Trade Center, New York, N.Y., this summer, it was announced by Viktor I. Bessmertniy, president and chairman of Amtorg, and Commissioner Andrew C. Axtell of The Port Authority of New York and New Jersey. Amtorg's new space at the Trade Center will be used as an information office to provide U.S. businessmen with full information on Soviet goods for export, particularly machinery, industrial instruments and equipment, and raw materials. Bessmertniy said: "The signing of this contract for setting up an information service for Amtorg will contribute to the promotion and strengthening trade relations between U.S.A. companies and Soviet foreign trade organizations, and involving a great number of American companies in trade contacts with Soviet trade organizations." Commissioner Axtell said : "I am convinced on the basis of my participation in the Port Authority's trade mission to Moscow and Leningrad last year, that a greater flow of trade between our respective nations will be of lasting benefit to our two peoples. Now that regular steamship service is available between the Port of New York-New Jersey and the Soviet Union, we can look forward to ever-increasing commerce between the U.S. and the USSR. In this exchange of goods, which I hope will flourish for years to come, Amtorg and the World Trade Center will naturally play a leading part." Also participating in the lease signing ceremony were Konstantin T. Lvov, general representative of Amtorg Trading Corporation in the USSR, and John B. McAvey, deput y director of world trade for the Port Authority. Amtorg's occupancy represents the first participation in the Trade Center of an agency of the Union of Soviet Socialist Republics. There are more than 50 nations represented in the World Trade Center, either through private firms or official Government agencies. In all, over 400 international firms and Government organizations are now doing business at the Trade Center. Amtorg Trading 'Corporation was established in New York in May 1924, to consolidate the representation of Soviet agencies handling trade between the United States and USSR. Amtorg also maintains an office at 355 Lexington Avenue in New York City.